Project title: Origins and development of Ancient Egyptian body concepts in Pre- and Early Dynastic anthropomorphic sculpture. The Ancient Egyptian way of representing the human body is often experienced as being distinct and very exact in following the principles of Egyptian art. Recognizing these representation as "Egyptian" is an easy task for every contemporary observer. Thanks to the abundance of related finds and written records from the pharaonic period, many aspects of meaning and function of anthropomorphic sculpture are well explored. 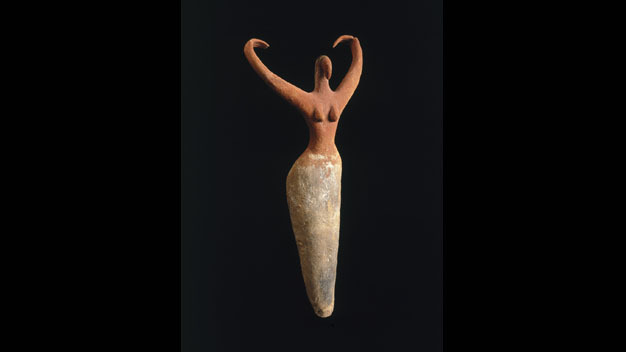 However, it is barely known how and why Egyptian anthropomorphic sculpture achieved its particular traits such as the typical proportions and aesthetics of the body, the focus on certain body parts, e.g. the eye, and the gender specific representation of clothing. The dissertation project wants to answer these questions by looking at the period of origin of the principles of Egyptian art because its understanding comes about through its roots. That is why Pre- and Early Dynastic sculpture (approx. mid/late 5. millennium B.C. – 2700 B.C.) should be aggregated to one corpus and analyzed in regards to the development of Egyptian body concepts. What makes up a human body? What is the focus in its representation? Do modifying elements like clothing or jewelry occur, and in which context do their representations appear? These questions will be answered by an investigation of the development of style, materials and the archaeological context. Anthropomorphic sculptures are direct self-expressions of humans about their self-perception, self-concept and their image of their community. Therefore, it can be assumed that different aspects of ideas about the human body deliberately and unconsciously entered its representations. To recover these underlying ideas cognitive scientific and development-psychological approaches will be used. The same applies to the distinction between their capacity as universal processes of human art production and inherent, culture-specific concepts. Another important aspect in the development of Egyptian body concepts is the change of human proportions in three-dimensional art. As proportions of the sculptures can be measured, the same applies to the changes over time. In order to perform a statistical evaluation of the development of proportions, the 3D models of a representative group of the sculptures will be measured. The Pre- and Early Dynastic time is one of the most exciting periods of Ancient Egyptian history. It is a highly dynamic phase which shows experimentation with community life, technology and religion. Different cultural groups grow together to form the foundation of the Ancient Egyptian culture. Pre- and Early Dynastic anthropomorphic sculpture is an impressive testimony of this dynamic.